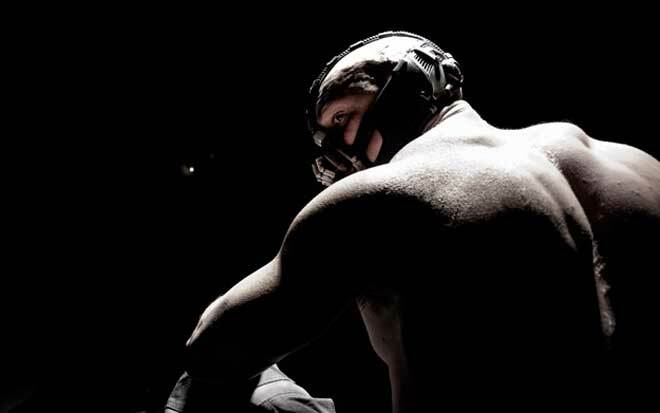 As Bane, actor Tom Hardy brings convincing menace to The Dark Knight Rises, at least in the prologue. HOLLYWOOD — Heath Ledger’s Joker blasted through the opening heist sequence of The Dark Knight with chilling conviction three years ago. Smart, scary and utterly riveting, Ledger set the tone for the rest of the picture by blending ice-cold humor with utterly remorseless criminal smarts. Director Christopher Nolan repeats that winning strategy in The Dark Knight Rises, as revealed in Thursday night’s press screening of the first six minutes of the highly anticipated follow-up. This time around, intense British actor Tom Hardy, playing Batman nemesis Bane, sparks his own “Holy crap!” moment about three minutes into an Abu Ghraib-inspired airplane hijacking from hell. If anybody stands a chance to sustain Joker-level ferocity, it’s Hardy. In Ritchie’s 2008 Brit gangster film that persuaded Nolan to cast Hardy as nervy dream-invader Eames in Inception, the 34-year-old actor played cockney thug Brutally Handsome Bob. That same year, Hardy ripped up the screen playing a devilish criminal locked up for years in solitary confinement in psychopath biopic Bronson (clip embedded below). To get into character as brilliant, hulking badass Bane, a character introduced by DC Comics in 1993, Hardy gained about 30 pounds. “Tom got huge,” Nolan laughed. As Bane, Hardy brings a sense of menace similar to Ledger’s Joker, at least as seen in Nolan’s brief opener. Hardy utters guttural commands from behind a piece of perverse head gear that looks like a cross between a mousetrap and a catcher’s mask. It’s a hell of a lot scarier on the big Imax screen than it appeared in stills and video grabbed by paparazzi during filming, or even in official images released by Warner Bros. Pictures. Besides establishing Bane’s bona fides as a bastardly mastermind, the Dark Knight Rises prologue, which will be shown ahead of Imax screenings of Mission: Impossible — Ghost Protocol beginning next week, serves to hype the jumbo-screen format that Nolan has long championed, with Bat-fans itching to get their first real glimpse of the final installment of the director’s gritty trilogy. Nolan noted that further inquiries about The Dark Knight Rises particulars would be moot at this point. “I’ve barely started to edit the rest of the film,” he said. The prologue may also offer some clues about mysterious Russian nuclear official “Leonid Pavel,” hinted at in a fake CIA wanted poster leaked to Underwire on Wednesday. New Dark Knight Rises details are expected to hit Friday at 10 a.m. Pacific on the viral Operation Early Bird website.